It’s sleek, stylishly business-like and would look at home in an office or in a cafe. In fact, it has a Kensington lock port, so you can secure it during coffee breaks. It’s thin, with a brushed metallic-effect, dark grey plastic shell. You’ll notice the frequent use of terms like “work day” and “business-like” during the course of this review. That’s because more so than any other Eurocom notebook I’ve reviewed to date, the Armadillo seems to effectively straddle the gaming and general purpose market. The computer is more effective than most Ultrabooks when it comes to mobile gaming and if you start to take advantage of the optional upgrade potential —maxing the RAM and sticking a big SSD in the free drive bay slot— it can get even better. At the same time, the Armadillo has everything most people would need for casual computing use or in an office setting. It has more than enough power to handle tasks like video streaming and number crunching, good battery life, a touchscreen display, a svelte premium look and it’s thin and light enough to tuck under an arm. 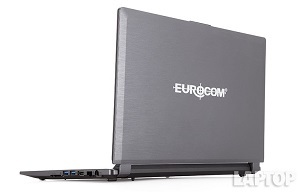 I’ve reviewed a number of Eurocom laptops in the past. In the process I’ve become a big fan of their approach. Their machines tend to have very robust power under the hood, restrained yet aggressive styling, and an undeniable sense of quality. They’re often not the smallest, lightest machines though. If you want to go small and light, and are willing to sacrifice on power then the there are a lot of options out there for you to choose from. That’s why I was surprised when I unboxed the Eurocom Armadillo. It doesn’t have a trace of bulk and feels as portable as I could hope for. Finally a Eurocom laptop I could happily carry around with me day to day. It has a fairly basic outward appearance with a dark grey plastic given a brushed metal texture to help hide fingerprints and give it a more tactile feel. Aside from the audio input and output 3.5mm jacks and the Kensington lock on the left side, you’ll find all the ports and plugs located along the right with none awkwardly tucked away on the back. The front edge has the indicator LEDs conveniently located so they’re always visible whether the laptop is open or closed, yet remain subtle so as not to draw too much attention to themselves. That seems to be the trend with this machine – everything is designed to be functional, elegant, and streamlined without drawing too much attention to itself. It’s a very humble yet confident design aesthetic that lets this laptop balance fitting in, while remaining distinct. This is a trend I’m very pleased to see continue with every Eurocom laptop I test drive, but is perhaps strongest expressed here. At a glance you can tell this laptop is something special but yet it never seems gaudy or like it’s trying too hard to broadcast that fact. That sort of quiet confidence speaks volumes for the Eurocom Armadillo. Once you open it up you’ll notice that the 14” touchscreen has an edge-to-edge flush bezel to give your screen a premium look and feel. 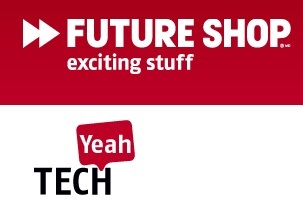 Nobody wants a fat plastic bezel surrounding the perimeter of their screen after all. I’ve become a big fan of touchscreens and find that they are becoming increasingly useful for both casual browsing, and creative work so I was very pleased to learn that the Armadillo’s screen had this capability. Many similarly appointed laptops, including the more popular models, inexplicably seem to forgo this feature, so it is one way that the Armadillo really shines for me. That screen is held on by firm, and solid feeling hinges that provide a satisfying level of resistance. When you try out as many laptops as I do, you realize that flimsy hinges can make a big difference in how cheap a laptop feels. Eurocom has no such problems here. The associated buttons do differentiate themselves from the rest of the wrist rest are, having a slightly different finish and material feel. This is handy since you won’t accidentally press the buttons and be able to find them by feel alone. I found myself looking down at the trackpad much less often than with some more popular laptops. In terms of performance, this machine has ample power for common daily work tasks. Most users would be well suited with the Armadillo for daily work life. Under the hood you’ll find a 2.4 GHz Intel Core i7-4500U processor, 8GB DDR3-1600 RAM, and a hearty 500 GB hybrid storage drive to keep things running quickly. Unlike many of Eurocom’s other laptops, I might not recommend this for someone looking to play too many games on it but for the student or business user, this is a nice laptop if you’re looking for something more unique than the usual matte silver laptops you commonly see down at the coffee shop. Weighing 2kg, and being a mere 22mm thin, the Eurocom Armadillo is well suited to be picked up and taken with you every day, to wherever you need to get work done. With its Core i7 processor and 16GB of RAM, this system is meant for everyday and business users who want a laptop that can handle their most demanding tasks. And with a massive 1TB solid-state drive (SSD), you'll be able to save all of your documents, photos, movies and "Simpsons" reruns and still have room to spare. The Armadillo's touch screen was responsive during everyday use. Tapping and selecting files was spot-on, and swiping from left to right between open apps felt buttery smooth. 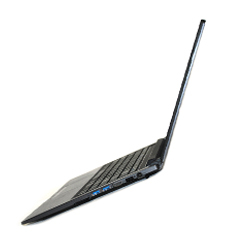 The Eurocom Armadillo features a 1.8-GHz Intel Core i7-4500U processor with 16GB of RAM and a massive 1TB solid-state drive. With those kinds of specs, we were able to open 10 tabs in Chrome and 10 tabs in Internet Explorer, stream a movie on Hulu and listen to Spotify, without seeing any stuttering or lag.